HP: 112, MP: ?, ATK: ?, DEF: ?, EVA: ?, SPD: ? HP: 600, MP: ?, ATK: ?/M?, DEF: ?/M?, EVA: ?, SPD: ? 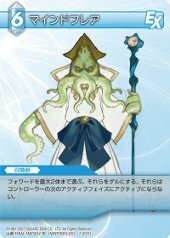 Mindflayers have appeared once under the Ice element in the FF-TCG series. Note that the card below is an Eidolon instead of a Monster.